Sis. Alice Perkins, who means so much to my family, went home to be with the Lord yesterday. Sis. Perkins and my mother, Naomi Houston, worked together for years and years (too many to count) at the Morning Star Missionary Baptist Church in Portland, Oregon. She later moved to California and we were in the same state convention, the California Missionary Baptist State Convention and would bump into each other from time to time there and at the National Missionary Baptist Convention of America. I’m saddened to hear of her homegoing and express my personal condolences to her family. She was so proud of the generation of us at Morning Star – Timothy Phillips, Karen Phillips, Anthony Phillips, Glenda Jackson, Marci Jackson, Ricca Ott, Wayne Phillips, Marie Hardy, Denise Hardy, Lee Peters, Clay, Russell, Pierre White, and the list goes on and on. Even when some of us left to make our own way in the world, that never disconnected her affection for us. She was a classic church woman. She wore them crowns! She served. She gave. She ministered. She encouraged. She corrected (and did it so smoothly). When I was a child, I used to think she could never get mad – she had such a cool persona. As we all grew older she hugged us, I think, a little stronger and was proud of how we all grew up and we all started out at Morning Star. My heart is heavy but I’m grateful for her influence on a generation of us. Many of our elders from Morning Star are now with the Lord, but we’ll never forget them. 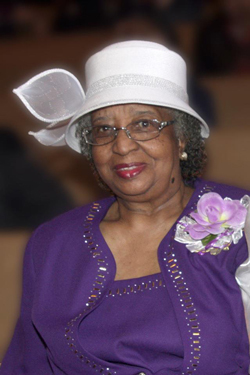 Rest In Peace Sister Perkins! See you in the morning! It’s been nearly 5 months since mommy went home to be with The Lord. While the days have been difficult I see that each day they become increasing easier. Thank you for writing this beautiful tribute. I am finally able to read it! I want to say thank you for the kind heartfelt words! Mommy loved you and would be happy to know you still held her in high regard after so many years! Be Blessed and keep us in your continued prayers!